Evolution of Living Organisms: Evidence for a New Theory of Transformation discusses traditional interpretations of evolution with a new assumption. The book presents a rational and general account of real evolutionary phenomena based on paleontology and molecular biological data. 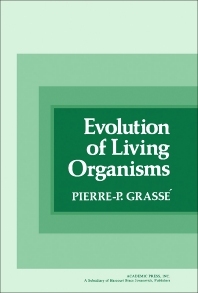 The text reviews biological evolution from the simple to the complex or progressive and regressive evolution. The author explains the appearance of types of organization from Captorhinomorphs to Pelycosaurs to the Theriodonts— from which the mammals arose. He also explains that in the evolution to mammals, the transformation of the Theriodonts concerned only the skeleton, muscles, dentition, and not the brain. He cites the case of the Perissodactyls as an example. The author also asserts that paleontology and molecular biology can explain the mechanism of evolution without even detailing the causes of orientations of lineages, of the finalities of structures, of living functions, and of cycles. But this approach will involve metaphysics. This book can be appreciated by anthropologists, researcher and scientists involved in zoology, paleontology, genetics and biochemistry. The Mammals: A Homogeneous or a Heterogeneous Class? Necessity and Persistence of "Stock Forms"